Curious about SUP yoga? Practicing while floating on the water is a much different experience than the typical yoga class, so it’s natural to wonder how this whole thing works. Allow me to illuminate the process. First of all, why do we love SUP yoga? When we practice on water, we have the lovely benefit of being surrounded by nature, being gently rocked by the waves. This gentle rocking, however, adds a bit of spiciness to yoga poses which may be simple on land. I call it Forced Mindfulness. Your mind simply cannot wander when you practice on water, because your body will give you a wobble of feedback to bring you back into the present. If you ignore that warning wobble, a splash might come next! Your core, quads, and focus must be engaged throughout the entire practice. That said, we typically see one splash in every 4 classes, on average. Falling in is truly no big deal, and just means the student was testing their edge, which is wonderful! How Do I Prepare for a SUP Yoga Class? To prepare for class, be sure to register in advance. There is a set number of boards, and they do sell out. 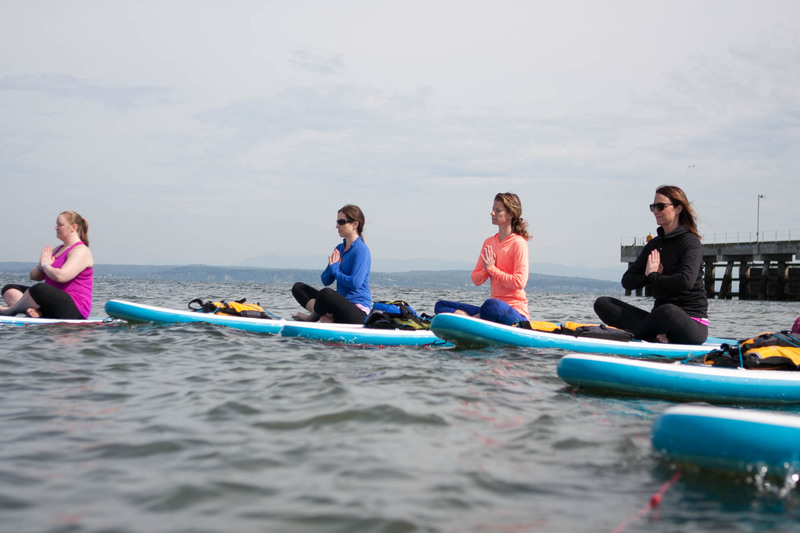 There is no need to take a stand up paddle lesson before taking SUP yoga. Absolute beginners in both yoga and paddleboarding are more than welcome! Wear weather-appropriate, fast-drying yoga-type clothing, and cheap sunglasses. Bring a change of clothes, because we do get a bit damp. Check out Alex Tran’s suggestions for more details on what to wear to a SUP Yoga class. Every teacher does things their own way, but here’s how it often works. Plan to arrive 15 minutes early to ensure that you can find the meeting spot, park, check in, and be ready when class begins. Your teacher will provide you with a board, adjust your paddle to your height, and give you a brief lesson in the basics of stand-up paddling. Your group will paddle over to the class location. Most teachers (including myself) will anchor your board so that, while you will sway with the water, your group will stay together. No need to worry about floating away. Your teacher will guide you through a practice modified to respect the challenges of your environment, typically moving through Sun Salutations, Warriors, and more, slowly and with focus. The experience is capped off with an incredibly blissful and buoyant savasana. Wind in your hair, sun on your face, water rippling around your board. You will leave with a happy heart, a bounce in your step, and a desire to come back again tomorrow! We often hear students say, “I wish I could do this every day!”. No more waiting for someday. Sign yourself up for the next SUP yoga class near you and experience the beauty of nature while challenging mind and body. You can do this.